Forget pissoirs and hole-in-the-floor squat toilets. In today's Paris, public 'sanisettes' are high-tech, self-cleaning, and mostly free. Here's what they look like and how to use them. ABOVE: This sanisette is near the Opéra Bastille (the glass building behind the tree). Not so many decades ago, the phrase "Paris public toilets" evoked images of smelly streetcorner pissoirs, hole-in-the-floor squat toilets at neighborhood cafés, and lavatories ruled by female attendants with the demeanor of prison guards. Today, nearly all of the vespasiennes or pissoirs are gone, and tourists of both sexes are well-served by modern, self-cleaning toilets known as sanisettes on boulevards and in parks throughout the city. You press a button (or, in some cases, insert a coin) to open the door, and when you step inside, a sensor in the floor causes the door to close and lock. You do your business, then open the door and exit. The door closes again, the toilet is automatically cleaned and disinfected by a motorized mechanism, and a green light signals that the lavatory is ready for the next user. Sanisettes are normally open from 6 a.m. until 10 p.m. After 2200 hours, you'll need to find a café or the nearest wall. In addition to sanisettes, the city of Paris has two dozen public lavatories that are open from 10 a.m. to 12 p.m. and from 1 p.m. until 6:15 p.m. 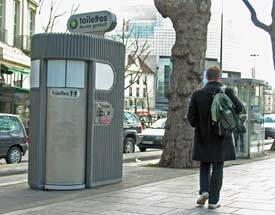 The lavatories have attendants and are mostly located near major public buildings and tourist attractions. Older sanisettes aren't wheelchair-accessible, but the newest models are. Sanisettes are complex, high-tech devices, and you may encounter one that's out of order. If that happens, look for another one, or head for the nearest café. Sanisettes are clean, but they can come with surprises, such as the dead mouse that we saw crushed under a sanisette's door near the Bastille. Also, the door opens automatically after 15 minutes, so don't plan to read the collected works of Proust while you're perched on the biffy. For illustrated directions on how to use sanisettes in Paris, please continue to the next page.